Banking on our enriched industry experience, we are able to supply PE Extrusion Line. 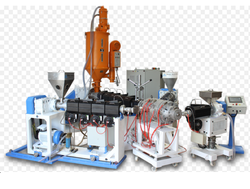 We are amongst the most reputed names in the industry, offering PE Extrusion Line. Our reputed entity is engaged in supplying PE Extrusion Line. 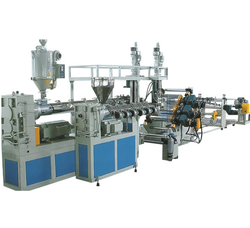 We are offering Single Screw PE Pipe Extrusion Line Speed Series. In order to meet excellent quality standards, we are supplying PE Extrusion Line. Rajoo has done pioneering developments in polymer foam extrusion in India and have emerged as the only supplier of foam extrusion lines christened Fomex using both blown film (Fomex – B) and sheet extrusion (Fomex – S) process using either chemical or physical foaming. We are a top-notch organization, engaged in providing PE Extrusion Line.